30 years ago, in the summer of 1985, the unassuming Superman Annual #11 appeared on comic stands around America. The cover, in a rarity for its time, announced the main contributors to the book in full at the bottom: By Alan Moore & Dave Gibbons. Both creators had garnered a following at DC, Alan Moore on the critically and commercially successful supernatural horror Swamp Thing (one of my all-time favourite comic-book runs) and Dave Gibbons on the superhero space opera Green Lantern. The bold declaration of these creators on the front shows the faith that DC Comics had in these two British creators. The issue was a special one-off story – a 40-page story written by two of the best contemporary creators and starring the four biggest characters at DC – Batman, Robin, Wonder Woman, and of course at the center, Superman. The story was the first of a couple Superman-centric stories Alan Moore would write. In 1986 he would follow up “For the Man Who Has Everything” with the two-part “Whatever Happened to the Man of Tomorrow?” published in Superman #423 and Action Comics #583, illustrated by classic Superman artist Curt Swan and inked by George Pérez and Kurt Schaffenberger. Whilst both rank among my favourite Superman stories, “For the Man Who Has Everything” remains my favourite of the two. It’s also my favourite Superman story behind Grant Morrison and Frank Quitely’s epic All Star Superman. It’s my favourite for two reasons – it’s a wonderfully self-contained story, with no loose ends (a miracle in today’s comic-book market); whilst a darker version of Superman, it doesn’t feature the bleakness that “Whatever” does; and it is perhaps one of the greatest character-studies in the history of American comics. For the 30th anniversary of the story, I thought it would be a good time to revisit this classic issue and find out what makes it so unique and special. 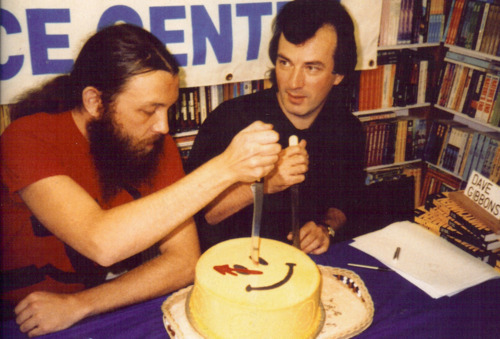 Alan Moore and Dave Gibbons at a signing for Watchmen in the late 1980s. One year before they would reinvent the graphic narrative with their masterpiece Watchmen, British writer Alan Moore and British artist Dave Gibbons would take on that most classic of DC superheroes, Superman. They would both take their unique flavour to the project and produce one of the character’s most intimate stories. Krypton or Coruscant? Krypton illustration excerpted from page 6 and Coruscant as seen in Star Wars Episode I: The Phantom Menace. 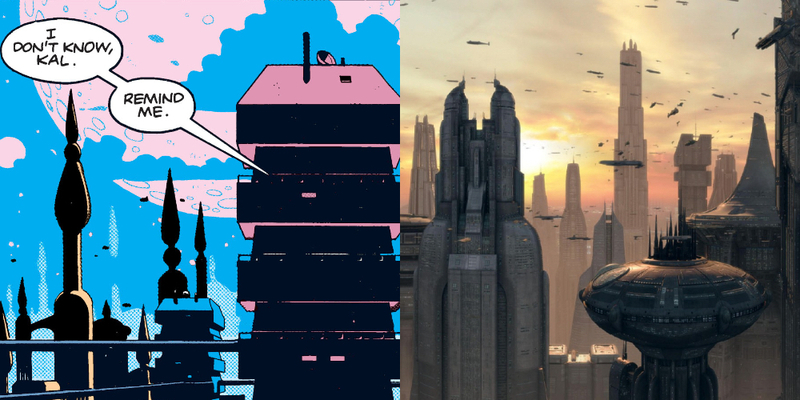 Dave Gibbons provides his unique and beautiful feather line to the story, conjuring brilliant visions of a decrepit Krypton – perhaps a source of inspiration and at the least a forefather for the planet of Coruscant from the Star Wars prequels. The highlight of Gibbons’ work though is his facial illustrations. He imbues the entire cast of characters with startling clarity and emotional focus. You’ll never forget the insanity on Jor-El’s face, nor the heartbroken glances of Superman as his fantasy unwinds. His anatomy work is also brilliant – the fight scenes between Wonder Woman and Mongul and then Superman and Mongul have an untethered ferocity that was lacking in the issue’s contemporary mainstream comics. 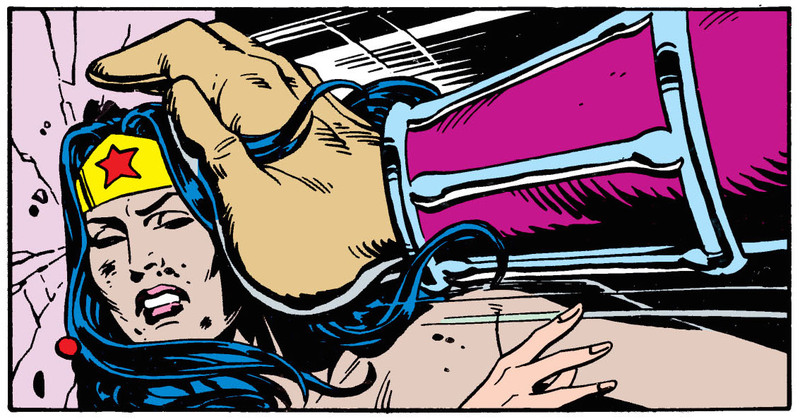 The fight scenes are brutal in “For the Man Who Has Everything.” Wonder Woman battles Mongul on page 19. However, as good as Dave Gibbons’ artwork is, Alan Moore’s writing is the true star of the issue. He breaks ground fiercely with the comic and creates perhaps the first true literary investigation into a classic superhero. As much as Swamp Thing was also reinvented in the classic The Saga of the Swamp Thing #21, “The Anatomy Lesson,” I wouldn’t really consider the character a classic superhero – he is a far more modern creation. Superman, on the other hand, was the first proper superhero – thus an entire genre of comics is named after him. In just 40 pages Moore delves into the psychology of the character in a way that other writer’s wouldn’t or couldn’t. This is what happens when you get such a talented writer treating these characters as real people – their actual character shines through the standard plots and machinations of the classic comics. That can be said of “For the Man Who Has Everything” in general. The plot is a standard comic story, not anything particularly original, but it is in how Alan Moore writes this plot that gives the story literary significance. Furthermore, the fact that the story is a single story in just 40 pages makes it a particularly delight. I would rank it among the very best of Alan Moore’s masterpieces. This is perhaps controversial considering it is such a short work, but I would rank it far above all of his work on The League of Extraordinary Gentlemen and V for Vendetta. Krypton’s purity has been shattered. From page 8. Perhaps the most notable aspect of the story is that the logical depiction of Superman’s greatest desire – that Krypton never exploded and he would have a normal life with a family – goes so dismally wrong. The phrase is “be careful what you wish for,” I believe. Due to the fact that Krypton never exploded, Jor-El has become a radical politician and frequents with religious fanatics in a hope to restore the former glory of Krypton. Krypton’s infrastructure has nearly broken. After the shrinking and disappearance of Kandor by Brainiac, the beginning of a lucrative drug trade and racial violence with immigrants, Krypton is no longer the wonder city that the Silver Age Superman comics supposed it to be. This completely destroys the parallels between Superman and the story of Christ (Krypton as a pseudo-heaven) and crafts it into more of a dystopia, something not unlike the dystopias of A Clockwork Orange or Nineteen Eighty-Four. Maybe Jor-El wishes Krypton had exploded so he could have kept his pride. From page 9. However, perhaps the most interesting facet of this fantasy is that in Superman’s wish for normalcy, all fantastical elements of his life – the weight of good versus evil – are reduced. With the removal and perversion of all good on Krypton, Krypton has fallen into an ugly state. This can specifically be seen in the maddened Jor-El. Jor-El, in all of the stories set on Krypton, has been seen as the very best of those on Krypton – a sort of figure for all to aspire too. Here, with his life’s research disproved he has retreated from his family, started hanging out with radicals and religious zealots, in an attempt to recover the purpose in his life that was destroyed the moment Krypton didn’t explode. It holds a dark mirror up to the life of Superman. If Superman’s purpose was removed, would he too become the evil of his father? Perhaps, perhaps not. But you can’t miss the dark parallels between the fallen Jor-El and those of Superman. Jor-El clearly has fallen far from the hero he used to be. From page 20. The comic brilliantly enriches the world of Krypton. From page 17. Another great element of Moore’s and Gibbons’ work is that they have built a real, breathing Krypton, something rarely seen before and rarely seen since. Sure, we’ve caught snapshots of that most fantastical planet before, but this is the first time that Krypton really felt like a real place with geography and streets and buildings. Most of this is achieved through the writing – Moore offhand refers to a lot of distinct neighbourhoods and streets. 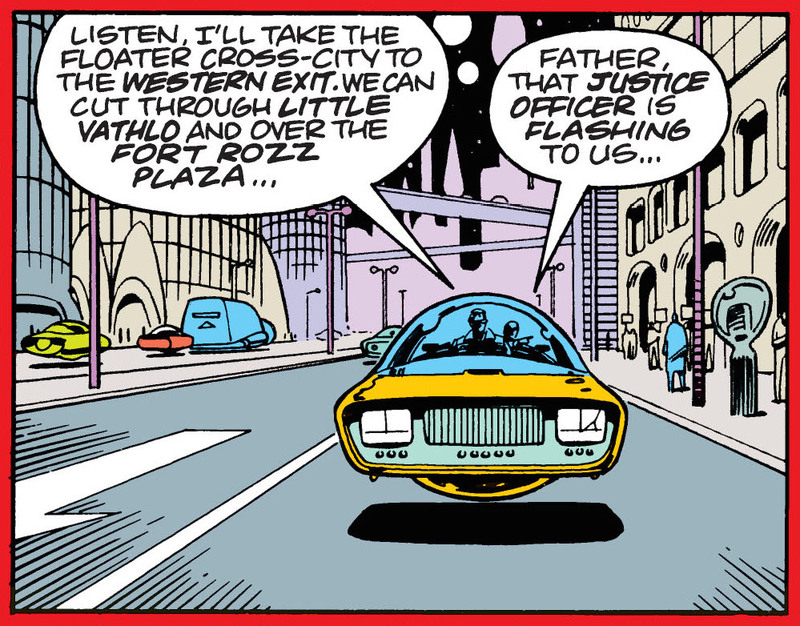 But Gibbons’ artwork also details this script, giving great visuals to these distinct neighbourhoods. However, this is frankly nothing compared to the secret history of the DC Universe displayed within the pages. For a first-time reader of comics, this will go over their heads and not impact their reading positively or negatively. But for long-time DC Comics readers, there are so many references in both script and artwork to the larger DC Universe. It is a brilliant showcase of interconnectivity with a larger comic-book universe whilst also being a standalone story. It’s something more recent comics should take note of – this is how to build a real distinct universe without cramming comics full of guest stars or locations. There is everything from Lyla Lerrol being Superman’s dream wife, the countless cameos in the final panels of the comic, and the reappearance of Mongul’s Warworld. One of my favourite elements of the comic is Moore’s description of Mongul and Superman when they fight at the end of the story. Most writers just leave the excitement to be pulled off by the artist, but Moore’s details in the captions really enhance and capture a brutality and realism that couldn’t be captured by art. Basically, his words place you in the scene, and you can feel the shocks and impacts of the blows. Alan Moore poetically explores the physical reality of superheroes. From page 27. Take for example the excerpt above. 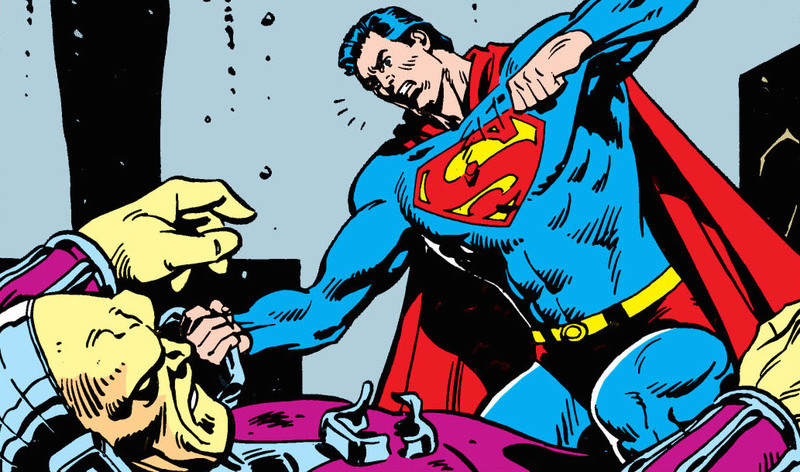 In most comics, this would be one panel of Superman bursting through a wall and flying straight into Mongul, with the use of speed lines for added emphasis. It would look good, but Moore takes it a step further here. By spreading the moment over three panels, Moore is able to capture the details of the scene. It’s tactile, sensitive – you can feel the wall rippling and exploding. This is some of Moore’s best writing of superhero comics. 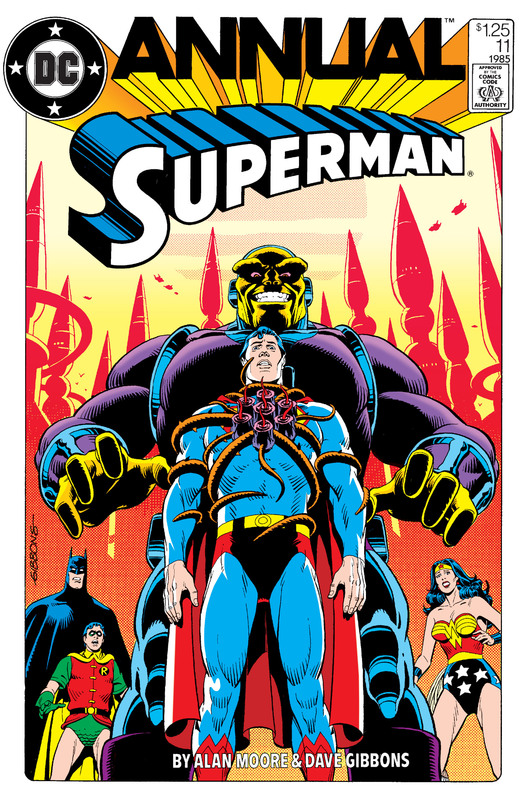 Alan Moore re-introduces Mongul as one of Superman’s most frightening villains. From page 10. 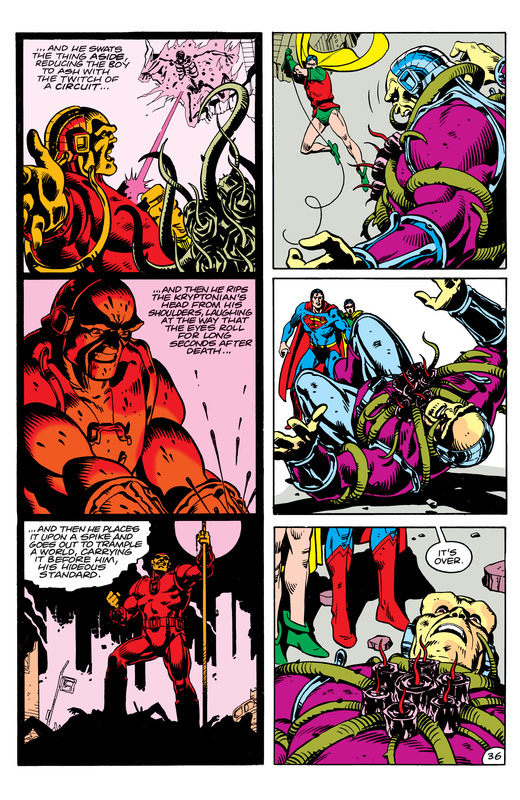 Alan Moore also writes one of the most memorable stories featuring one of Superman’s villains, Mongul. A yellow hulk wearing a purple leotard, there is no way this villain should be as scary as he is. But through very simple reasoning, Moore crafts him into one of Superman’s most frightening villains. Mongul delivers some iconic and chilling dialogue. From page 12. His concise explanation of how he beat Superman with the use of the Black Mercy is chilling in its intelligence. His refusal to explain to Batman who he is denotes a massive superiority complex. 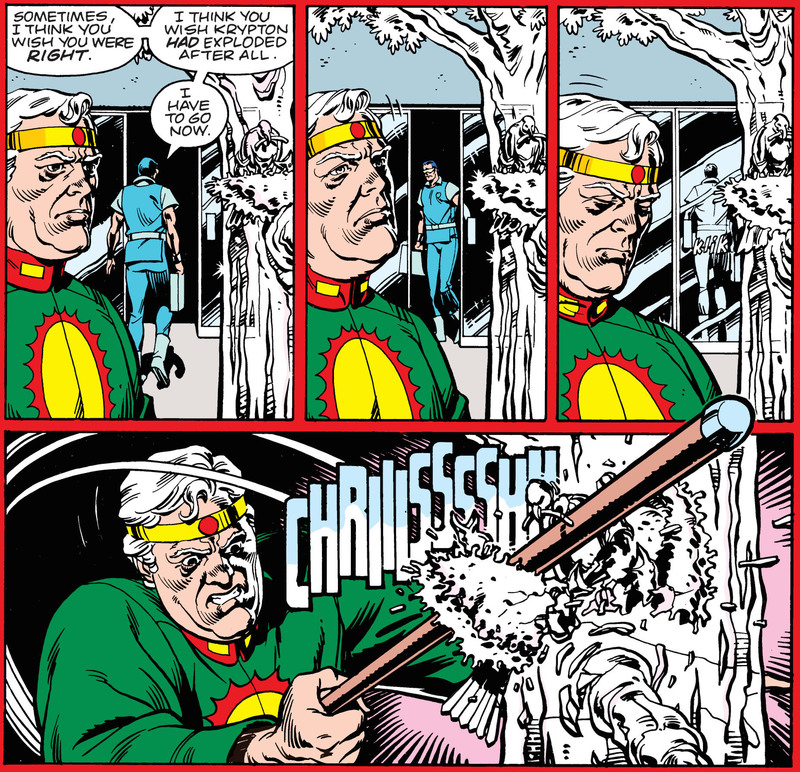 And then asking the group of heroes, with the now famous chilling line, “Which of you would it be polite to kill first?” turns him, in two pages, from a standard C list villain to one of Superman’s most ruthless and terrifying. My favourite moment has to be when he tells the heroes to stop Robin from walking about: “Oh, and please tell the little yellow creature to stop shuffling. It distracts me.” It all adds up to making him a psychologically complex and unique villain, even if we don’t get a complete explanation of his motives. Page 36 parallels Mongul’s dream with his fate. It is only after Mongul is beaten, however, that we get a glimpse of the true extent of his insanity. 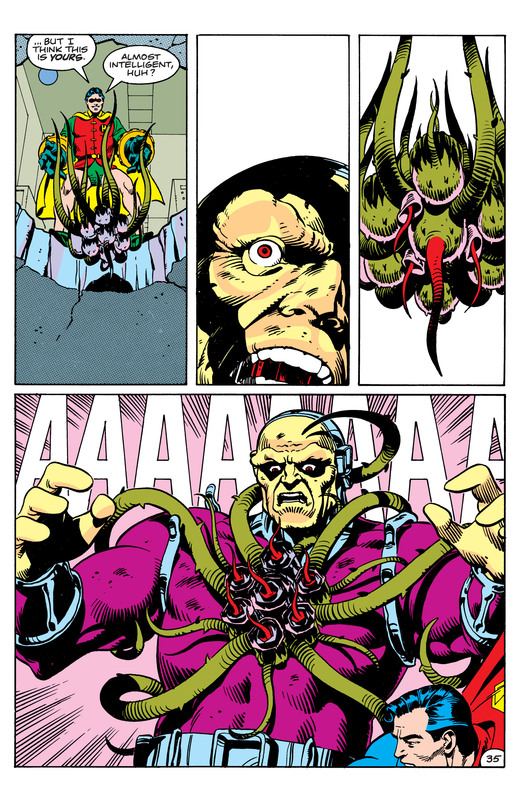 When Robin defeats him by dropping the Black Mercy on him, parallel panels show his defeat whilst Mongul’s dream plays out – knocking aside the Black Mercy, killing Robin, then tearing Superman’s head off and using it as his standard when he conquers the galaxy. It’s a brilliant piece of writing and artwork, showing that Mongul would never have the self-control that Superman has showed by giving up his dream to face Mongul. Furthermore, the one-page Epilogue details even further the dream he is trapped in, revealing him as perhaps the ultimate Darwinist nightmare. 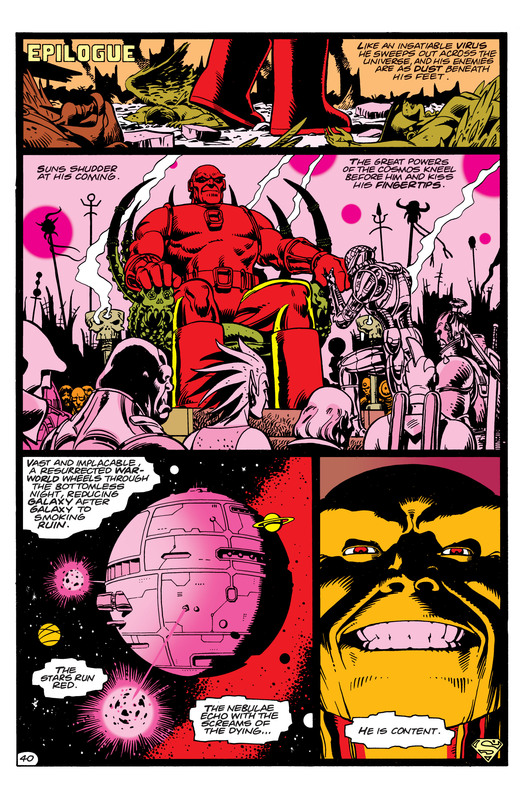 Mongul as Darwinist nightmare in the Epilogue on page 40. The comic, despite being a Superman story, also functions well as a Robin story. A frequently derided and ridiculed sidekick, Robin has a great character arc in “For the Man Who Has Everything.” When we first meet Jason Todd, the new Robin, he is as juvenile and useless as previously pictured. 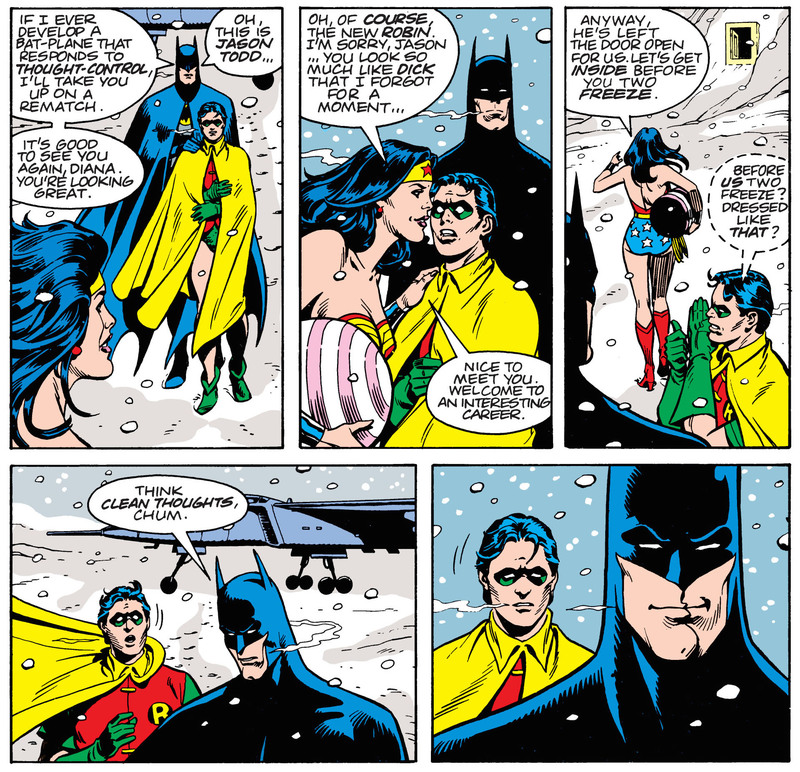 Moore adds to this by making him into a horny teenager, leading to one of the funniest moments of the strip when he comments on Wonder Woman wearing so little in the Arctic cold. “Think clean thoughts, chum” always delivers a smile. Jason Todd’s adolescence provides some quick comedy. From page 2. However, when the Black Mercy detaches from Superman and attaches to Batman, Robin proves to be the smartest of all the characters. 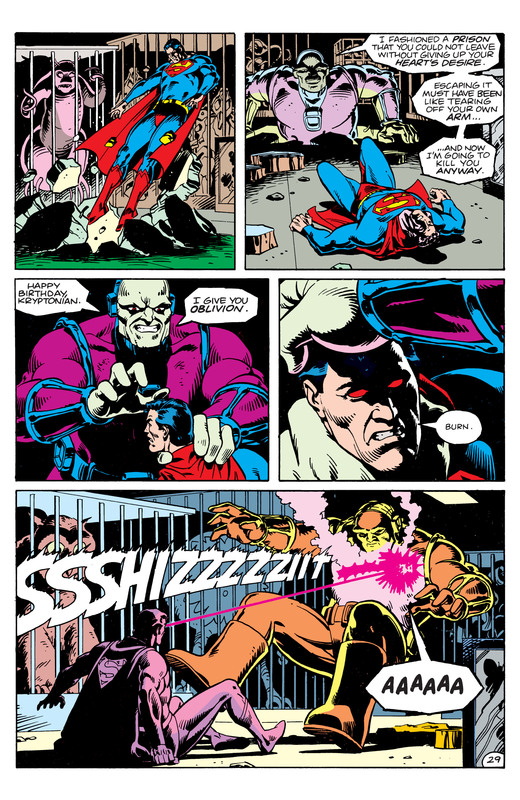 Whilst Superman tries to best Mongul in a match that is equal, and Wonder Woman has been beaten senseless at this point, Robin thinks to use the Black Mercy against Mongul to defeat him. His moments of capturing the Black Mercy, containing it, and transporting it to Mongul show him to be intelligent and resourceful – resources that he’ll need. When he finally defeats Mongul, it is a moment of triumph, showing that humans are not “almost intelligent,” as Mongul previously said. He outwits Mongul. 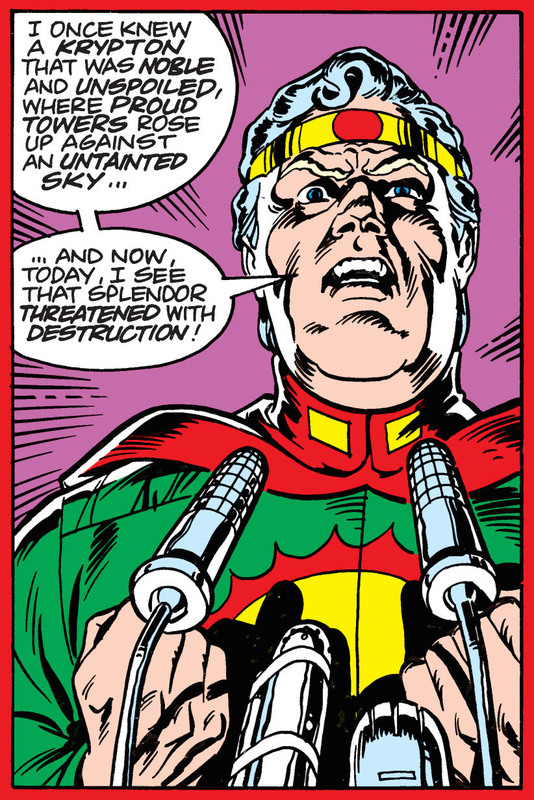 Jason Todd proves himself by defeating Mongul on page 35. By doing this, Jason Todd proves himself as the new Robin in a trial by fire. 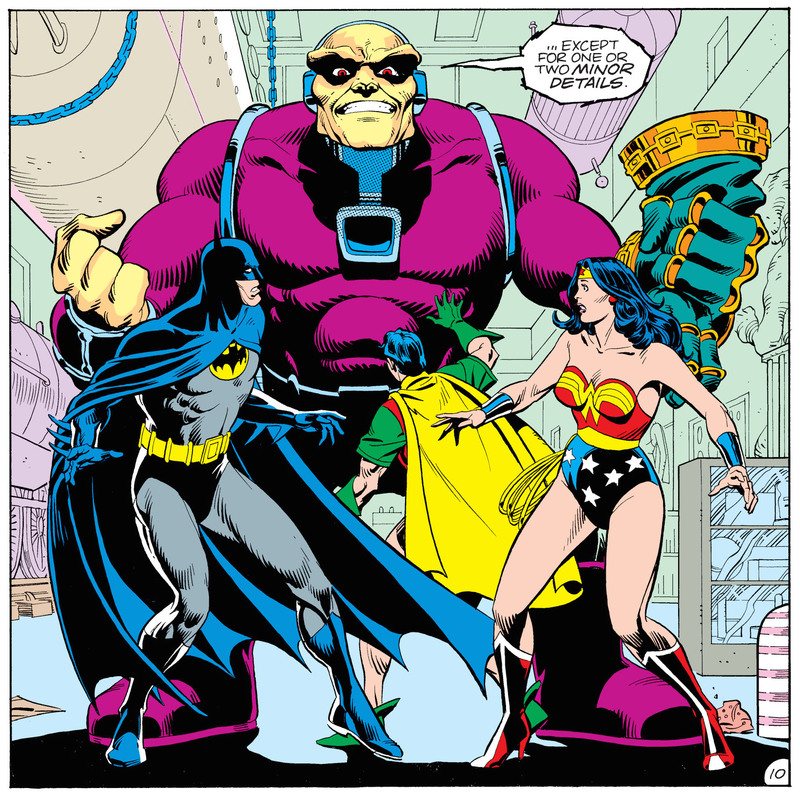 Whereas Wonder Woman and Batman were both incapacitated by Mongul and Superman wasn’t really getting anywhere by trying to match his strength, Robin used his wits and ultimately defeated Mongul when the others couldn’t. It’s a great moment and works as a coming-of-age story for Robin. However, the greatest character study the issue offers is obviously that of Superman. Superman’s greatest wish as granted by the Black Mercy is to lead a normal life. For him, this means being happily married on Krypton with his people. He leads a normal job as an excavator at the Kandor crater. Superman is perfectly happy, despite a tortured relationship with Jor-El. Superman is happy. From page 1. However, Superman’s characteristic is to protect people. And when his cousin Kara (in reality Supergirl) is brutally attacked by Phantom Zone protesters, he knows something is wrong. He can’t put his finger on it, but he knows something is wrong. Ultimately he can’t accept this reality – despite having his greatest wishes, Superman puts others before himself, and he knows that thus the reality of Krypton is discordant with who he is. Life could never have got this bad had he not intervened as he always does. So it must be fake. This leads to an absolutely heart-breaking scene in which he is separated from the son he never had. Superman is separated from his son as the Black Mercy loosens its hold on him. From page 23. Superman expresses his fury. From pages 29. 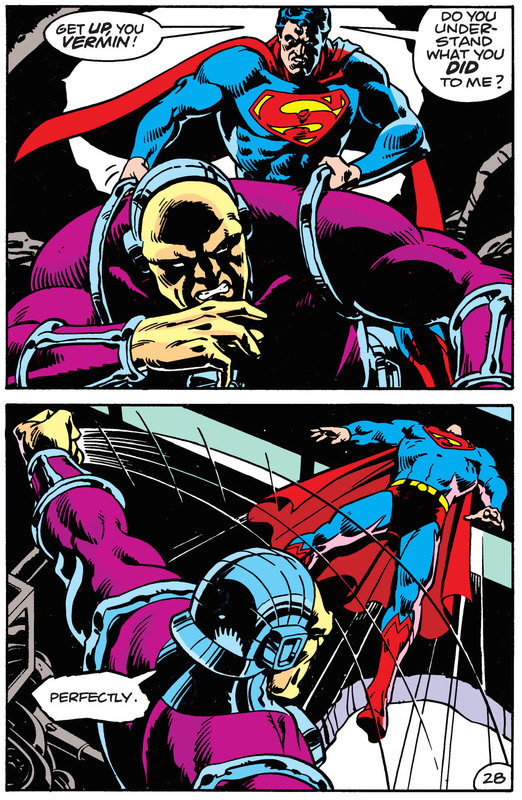 Ultimately, though, Superman defeats Mongul. He celebrates his birthday with his friends. We can see that the events have severely marked him when he tells Batman that it’s probably for the best that the new rose Batman had bred named Krypton was stepped on in the battle. The final panel with Superman reconfirms that despite the traumatic events, he will bounce back. With the company of his friends, and with his own personal strength, he has beaten Mongul. All wounds heal. Superman is ready for his birthday party. From page 39. Well I hope you all enjoyed this look back at “For the Man Who Has Everything.” I certainly enjoyed looking back and talking about one of the greatest Superman stories ever published. I hope to make these anniversary retrospectives a recurring thing on Tales From the Border, so make sure to look back every now and again to check for more updates. Thanks for reading, and I’ll see you in the funny pages!